Iran this month unveiled details on two shoulder-fired surface-to-air missiles that are a major concern among U.S. and allied counterterrorism officials due to Tehran’s support for global terrorist groups. Iran on Dec. 8 published a report outlining the specifications for what it calls the Misagh-1 and Misagh-2 shoulder-fired missile system. The report in the state-run Islamist Tasnim news agency stated the missiles are superior to the U.S. Stinger anti-aircraft missile and Sweden’s RBS-70 missile system. According to the news agency, both variants of the missile are 1.5 meters long and can hit targets at a maximum altitude of 4,000 meters. The report said the Misagh-1 travels at a maximum speed of more than 600 meters per second, and have a total weight of 16.8 kilograms. The Misagh-2 travels at speeds of 850 meters per second. The missile’s explosive warhead weighs 1.42 kilograms. The guided missile uses "fire-and-forget" technology that allows the missile to home in on targets. It did not say what type of guidance but it is likely an infrared seeker system. According to the report, Iran’s military places great emphasis on shoulder-fired missile launchers because of the ease of carrying the weapon in the field and because most of Iran’s anti-aircraft artillery are fixed units and lack firepower. U.S. officials are concerned about the Iranian portable missile because of Tehran’s close ties to international terrorist groups, notably Hezbollah. Iran has supplied Hezbollah with a range of rockets and missiles. Israel has recently conducted several airstrikes in the region in an effort to prevent the spread of Iranian weapons from reaching Hezbollah. Shoulder-fired missiles are considered an ideal terror weapon because they can be easily concealed and launched quickly. The major fear is that the weapons will be used against civilian commercial airliners. In November 2002, terrorists in Mombasa, Kenya, fired SA-7 missiles at an Israeli airliner with 261 people on board. The missiles narrowly missed the jetliner but highlighted the growing threat of terrorist attack using shoulder-fired missiles. Syria’s Islamic rebels have obtained Russian-made shoulder-fired anti-aircraft missiles from depots in Syria and have used the weapons against Syrian government helicopters and aircraft. The U.S. intelligence community has for the past several years been engaged in a covert action program to purchase shoulder-fired missiles from international black market and gray market arms networks. The effort was launched in 2011 after the fall of Libya’s Moamar Gadhafi. Thousands of Libya’s shoulder-fired missiles were stolen in the aftermath of the revolution that toppled Gadhafi. Some of the arms reached Islamist rebels. The CIA operation in Benghazi was part of the covert action program to recover loose shoulder-fired missiles. A report published earlier this year by the Federation of American Scientists warned about the spread of shoulder-fired missiles, also known as man-portable air defense systems, or manpads. The report identified the Misagh-1 and Misagh-2 as "third- and fourth-generation manpads" that were acquired by armed groups since 2002, but in smaller numbers than less sophisticated portable missiles. The report said it is unclear whether the Misaghs are indigenous Iranian missiles or variants of Chinese missiles. 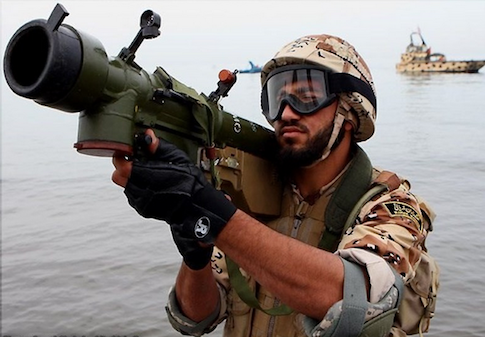 It noted that Iraqi insurgent groups are armed with Iranian Misagh-1 missiles and Chinese-made QW-1 missiles. Iranian portable missiles also are used by terrorists in Yemen. U.S. forces found several Misagh-1 missiles in a cache near the Baghdad airport in 2004. "Despite global counter-manpads effort, terrorists, insurgents, and other armed groups continue to acquire and use manpads," the report said. This entry was posted in National Security and tagged Hezbollah, Iran, Terrorism. Bookmark the permalink.